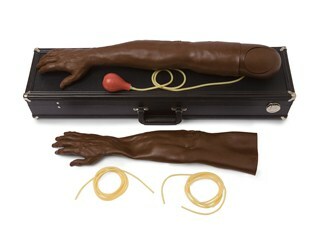 Lifelike adult male arm reproduction in brown skin tone with infusible arteries designed for training the proper arterial puncture procedure for blood gas analysis. Arm has injectable deltoid pad and fits adult male manikins. Includes: 1 Adult Male Arterial Arm - Right, 1 Replacement Skin and Artery Set, 1 Set of Shoulder Attachment Hardware, 1 Bottle of Red Simulated Blood, 1 Can of Manikin Lubricant, 1 Carry Case and Directions for Use. *Replacement Skin and Artery Set to fit this arm is available for purchase using catalog number 375-80150B.